Half day OPTION 2 *Ref. 0182E (NO Tuesdays, NO Thursdays in Winter) Bus tour includes Guards Change (if available), River Cruise, Entrance fees to the Tower of London and the Crown Jewels. Both tours Fully Escorted by Professional Tour Guides. Historic London Tour fully escorted. Your Tour Guide will show you some of the best parts of London. See its most popular monuments, squares, streets, its history, its contemporary life and its most unusual sites parade in front of you in a gentle commentary alternating to stops near the most strategic and impressive corners of London. The tour passes many famous places such as: Big Ben, the Clock Tower, Horseguards, the Parliament buildings, Whitehall, Downing Street, the London home of the Prime Minister. Hyde Park, Speakers Corner, Trafalgar Square & much more. See the National Art Gallery, Admiral Nelson's statue on his tall column, Buyckingham Palace and stop for the colourful Changing of the Guard ceremony (when available). A stop will be made for photos In any event to see St James Park and Buckingham Palace. Elegant Mayfair and Piccadilly Circus, the heart of London’s West End with its theatres, cinemas, nightclubs, restaurants and shops. Option 1 is the cheaper version of the tour: a panoramic introduction to the highlights of London with stops in tsome of the most historic places in London. 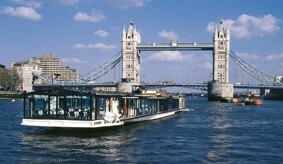 * Option 2 in addition this, includes a River Thames Cruise, entrance fees to the Tower of London and Crown Jewels.